At the end of World War II, Germany was partitioned into four separate areas, each controlled by the four allied powers: the United States, the United Kingdom, France, and the Soviet Union. As relations with the USSR deteriorated, the split hardened into just two separate regions: West Germany, supported by the United States and other Western democracies; and East Germany, which was controlled by the Soviet Union. The Berlin Wall, constructed by the German Democratic Republic (GDR) in 1961 to separate West from East Berlin, became a symbol of the division between democracy and communism. East Germany cut its citizens off from the West and violently put down a rebellion in East Berlin in 1953. 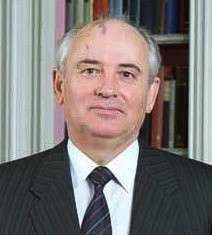 When Mikhail Gorbachev became General Secretary of the Communist Party of the Soviet Union in 1985, he and President Ronald Reagan established a rapport which allowed the United States and the USSR to improve relations. Eventually, the unthinkable happened — on November 9, 1989 the Berlin Wall fell, representing the symbolic end to the Cold War. The following is a speech given by Ambassador J.D. Bindenagel, who was the former Deputy U.S. Ambassador to the German Democratic Republic from 1989-1990, at the University of Notre Dame on the tenth anniversary of the Fall of the Berlin Wall. In his speech he provides his personal experiences with the fall of the Berlin Wall and examines the developments that made it possible. Read also about how the U.S. dealt with a reunified Germany. BINDENAGEL: The major conflict of ideas that has shaped my career was the East-West confrontation between capitalism and communism. In fact, I have spent a majority of my professional career defending freedom from the communist threat. The symbolic vortex of that conflict was at the Fulda Gap in Germany, where a million soldiers from NATO were lined up against a million soldiers from the Warsaw Pact ready to destroy the world. I myself was an infantry officer in Wuerzburg, Germany, near the Fulda Gap, this main Soviet invasion route across Central Europe. The division of Berlin, symbolized by the Berlin Wall, was for us a deeply terrorizing reminder of man’s inhumanity to man. During the first year of the Berlin Wall more than 50 people died trying to escape the communist paradise. On August 17, 1962, 18-year-old East Berliner Peter Fechter tried to escape near Checkpoint Charlie. As he climbed the Wall, his own East German border guards shot him. For hours he lay helpless and unattended at the foot of the Berlin Wall while he bled to death. The worldwide rejoicing at the fall of the Berlin Wall on November 9, 1989 was easily understood everywhere as an end to this affront to the dignity of human beings everywhere. Throughout its 28-year existence, the Berlin Wall divided, but did not conquer the spirit of the Germans in the German Democratic Republic. The end of the Berlin Wall brought a new, reborn Germany – the Berlin Republic – dedicated to human dignity, founded in democratic institutions of the Bonn Republic and the democratic revolution in East Germany. Let me share with you one anecdote that captures the spirit of freedom on the 1989 Revolution. I was a fortunate eyewitness when the Berlin Wall came tumbling down (“Ich war dabei”) twenty-eight years after the East German leader Walter Ulbricht erected this hated symbol of communism and division. I was the deputy American ambassador in East Berlin reporting on that democratic revolution that would bring down the Berlin Wall, help end the cold war and create a new order, in which Germany emerged once again united, sovereign and strong. 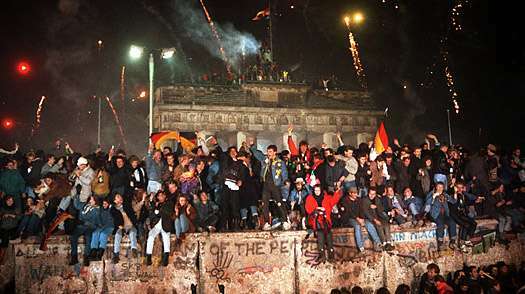 Throughout the year 1989, dramatic events stirred a new sense of freedom in the world and challenged the cold war. Soviet President Gorbachev began his glasnost [restructuring] and glasnost [openness] experiment. Students in China demonstrated for democracy on Tiananmen Square and were brutally crushed by communist tanks. In the two Germanys 2 million soldiers still stood face-to-face across the Berlin Wall ready for war. On the night of November 9, 1989, the entire world held its breath waiting for the Soviet tanks to roll and crush the German revolutionaries as they had done in 1953. Although the Soviet tanks did not roll out, revolution has changed our world. The United States throughout the Cold War preached self-determination in an effort to promote democracy movements and stationed millions of American soldiers in West Germany to deter a communist attack. East Europeans had repeatedly tried and failed to find freedom and break the yoke of communist rule. Despite failed attempts in East Germany in 1953, in Hungary in 1956, in Czechoslovakia in 1968, and in Poland in 1980, in the summer of 1989 the Central Europeans tried again. At the American Embassy in East Berlin, we knew that the Red Army’s response with its million Soviet and East German soldiers deployed along the German-German border would determine the success or failure of this new democratic revolution. A Washington Post editorial in August that year reminded us that if the Soviet Union intervened anywhere in Europe to protect its interests, it would do so in East Germany. Nevertheless, some East Germans wanted their freedom and sovereignty and were willing to demand some of their rights guaranteed in the Helsinki Final Act signed by their communist leader, Erich Honecker. These brave souls sought freedom to travel and abolishing the East German travel law became the symbolic cry for political freedom during their revolution. They knew the words of President John Kennedy that free men everywhere would be proud to call themselves Berliners, and they knew President Ronald Reagan’s challenge to Soviet President Mikhail Gorbachev to tear down the Berlin Wall. They were testing that strong bond of common destiny in our commitment to the dignity of man, the rule of law, and freedom. Based on our embassy’s reporting, President George Bush was told in his November 9 morning briefing by his intelligence briefer, that the GDR had opened possibilities for freer travel for its citizens and that the Berlin Wall might as a result become “irrelevant,” the very description used by the American Embassy’s Political Counselor Jon Greenwald report. Now was the time to determine whether this revolution fit the definition. I had never lived through a revolution and only knew the textbook definition. I was about to experience it very personally. Events during that Thursday in November were calm; President Gorbachev had ended his visit in honor of the 40th anniversary of East Germany with a warning about the dramatic events East Germany saying, “Those who come too late will be punished by history.” Little did we now that history was about to overtake us. That same evening in Berlin I attended Aspen Institute Berlin Director David Anderson’s reception for his new deputy, Hildegard Boucsein, with the mayors of East and West Berlin, the Allied Military Commanders, East German spy-swapping lawyer Wolfgang Vogel and many others. We were an unsuspecting group of insiders. 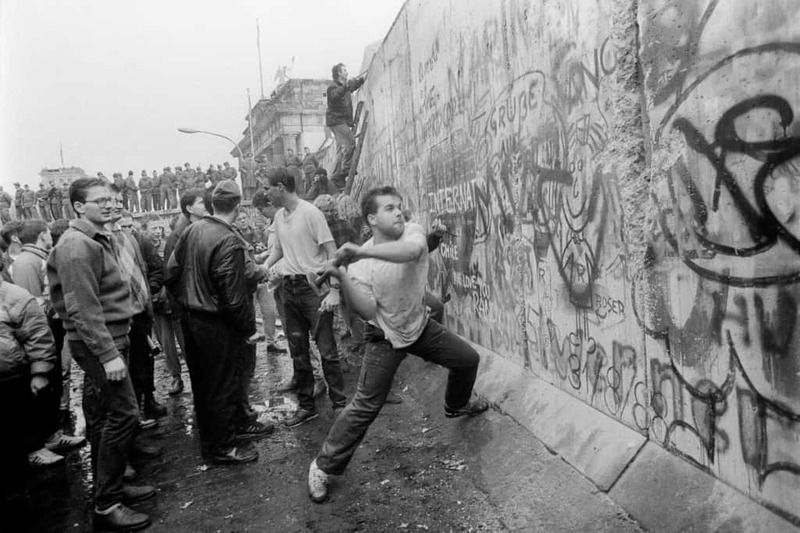 What was about to happen at the Berlin Wall later on November 9, 1989 would be a surprise to us all. At the end of the reception, East German lawyer Wolfgang Vogel, who had negotiated the freedom of Soviet dissident Sharansky and earlier the U-2 pilot downed over Russia, Gary Powers, asked me for a ride to West Berlin where he had parked his car. Of course I was pleased to offer him a lift and to seek his assessment of the East German reaction to the changes in November 6 GDR Travel Law that had been rejected by thousands of demonstrators throughout the country. Vogel as Honecker’s lawyer was most likely to know the GDR’s next steps. A few months earlier when U.S. Ambassador Richard Barkley and I visited Vogel at his modest home on the Titi Lake, he told us that the Hungarians would likely allow several hundred East Germans in Hungary escape to the West. The Hungarians had dramatically cut down the barbed wire fence along their border in May. Indeed, the Hungarian border was viewed as an escape hatch from the Communist bloc and cutting down the fence launched a flood of refugees in late summer. 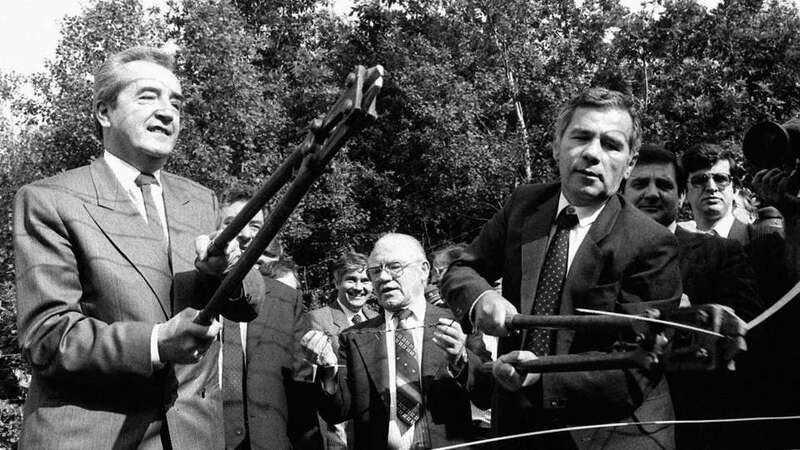 The Hungarians were about to honor their new commitment to a UN convention on refugees and to ignore their obligations under the Warsaw Pact to return East Germans to the GDR. Vogel would surely clue me in on Politburo thinking about how to respond to the revolutionaries’ demands for the right to travel freely. On our way to the downtown West Berlin’s heart on the Ku’dam, Vogel told me that the GDR attorney’s collegium had met November 7-8 and proposed additional changes to the GDR Travel Law. Vogel thought the new changes, not yet announced, would satisfy East Germans’ demand for more freedom of travel. As I drove into East Berlin around 7:30, the acrid smell of sulfur from East Germany’s brown coal met me. It was a knowing feeling that the smell brought to my nostrils; the smell clung everywhere, in my clothes surrounding the buildings. The smell of brown coal gave the whole of East Germany that sinister, dreary appearance that had become so familiar. I went directly to the embassy where I found a greatly excited political section. They were stunned by East German government spokesman Guenther Schabowski’s statement on television. He had told the world that the Politburo agreed to more changes in the Travel Law and East Germans could get visitor visas quickly (“in kurzem”) for travel to the West from their local “People’s Police” and the GDR would open a new processing center to handle emigration cases immediately. He rushed to the western side of the Brandenburg Gate to announce to the world that the Berlin Wall was open. The East Germans heard; “Travel to the West is possible immediately.” The revolution, once remarkably controlled, with its Monday night demonstrations in Leipzig and Dresden, seemed to be spinning out of control. We sent one embassy political officer, Heather Troutman, directly to Checkpoint Charlie and another, Imre Lipping, to the GDR press center to get the text of the statement. 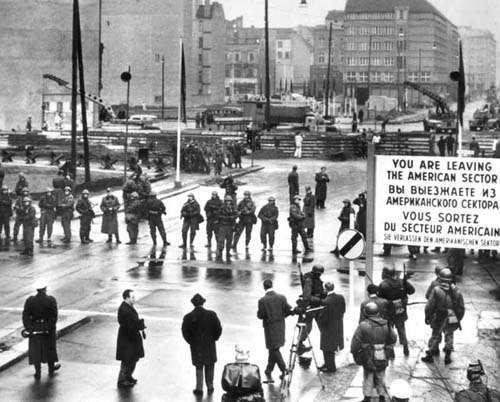 While we were hunting down the travel law text, the first East Germans, attempting to cross without visas, were sent back home by the guards at Checkpoint Charlie who told them to first get visas. It seemed to us that the GDR guards could keep things under control, while the new procedures were being worked out. With the text of the announced freedom to travel and emigrate in hand, we translated it and cabled it to Washington. I telephoned the White House Situation Room and State Department Operations Center to make sure they had the report and to alert them to the latest developments. Then I called Ambassador Barkley and the American Minister in West Berlin Harry Gilmore, and we diplomats shared our quick assessment of the Politburo announcement. We thought the East Germans would get their visas and then head to West Berlin. 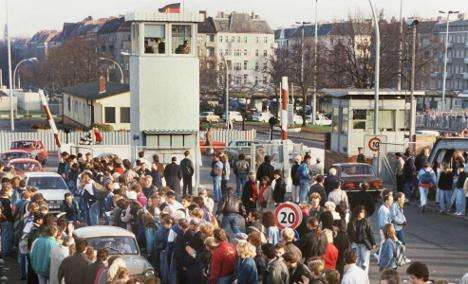 Little did we know how quickly the East Germans would test the will of the border police to let them leave and return. After assuring ourselves that we had reporting officers in place to follow events and had reported the latest news, I headed home to the near-in East Berlin suburb of Pankow around 10:00 p.m. As I drove up Schönhauserallee in East Berlin I was surprised to see so many East German, plasticized pressed-wood Trabant automobiles seemingly abandoned near the Bornholmerstrasse checkpoint crossing over the S-Bahn train into West Berlin. At the end of the street near the checkpoint, I saw dozens of Germans standing at the barrier and shouting at the guards defending the crossing. I knew the crossing well. I crossed it regularly; my children crossed there daily to attend the German-American John F. Kennedy Schule in Zehlendorf, West Berlin. Inside the crossing were barracks filled with armed border police. Fire hoses, like those used later at the Brandenburg Gate were carefully laid out in readiness to repel any wall jumpers. Across the checkpoint safely in the West, the bright lights of a TV camera crew, was poised on the bridge ready to instantaneously transmit pictures of this confrontation at the bridge around the world. I hurried through the last few blocks to get home quickly. Inside, I turned on the television to see which pictures were being beamed at the East Germans from the camera I had seen. My wife Jean rushed in to the TV room worried I would wake our children. I explained the latest events and how our worry seemed to be turning into excitement as we witnessed the fall of the Berlin Wall. I called Ambassador Barkley, Jon Greenwald our political counselor and Harry Gilmore 95in West Berlin. We knew events would soon envelop us. A few hours later, around 6:30 a.m., I followed my third-grade daughter Annamarie’s school van to Bornholmerstrasse on her way through the crowd to school in the West. Her van moved into the masses of people now streaming in both directions. Seeing the red diplomatic license plate, the people stepped aside to let her through. I stood there watching my child disappear into the West with some uncertainty of her fate. My son Carl was to follow in less than an hour. GDR radio announced that visas were required to travel as of 8:00 am on November 10. I stayed at Bornholmerstrasse and as the hour approached the crowd grew larger and pressed against the checkpoint as panic spread. The fear of being shut in, of having missed the chance to see West Berlin before the GDR shut the gate, was palatable. Shortly before that appointed hour, that deadline was moved to noon. Later, the deadline was revised to Monday. However, by Monday the Krenz government had lost its legitimacy and its authority; the people had demanded and won their freedom. Power and authority had passed from the SED government to the people, who were now in charge. No one knew what would happen next. We were all caught in the blurring pictures of the revolutionary video stuck on fast-forward. Events in those hours overwhelmed us with a mixture of anxiety, euphoria and hope for the future. When our children, Annamarie and Carl, returned from the John F. Kennedy Schule in West Berlin, my wife, Jean, and I decided that we, too, would test the new openness of the Berlin Wall. We ventured down to the Wall at Eberswalderstrasse, where the buildings were in the East and the sidewalk was in West Berlin, and where terrible scenes of desperate people jumping to their freedom or death [took place] in 1961 when the Wall was built. The “Bausoldaten,” soldiers on construction duty, were deconstructing the Berlin Wall at Eberwalderstrasse. They had already taken several three-meter tall, one-meter wide sections out of the Wall by the time we arrived. Lined up in front of this gaping hole were hundreds of East Germans dutifully waiting for the East German Volkspolizei to issue them visas in accordance with the November 9 Schabowski statement. We had our diplomatic identity cards and proceeded to enter the no-mans-land through the new crossing point. As we, accompanied by our dog “Willi,” stepped into the eerie space between East and West, seven-year-old Carl exclaimed; “There are two walls.” Indeed, at the end of the no-man’s-land stood towering above us was the whitewashed wall on the western side. We crossed into West Berlin with numerous East Germans and were greeted with cheering West Berliners and a sense of time suspension. Disoriented, we found a playground for our children where they played while Jean and I tried to absorb the strangeness of standing in West Berlin amid so many East Germans. Unification had just happened among the Germans and we were witnessing the mixture of two conflicting systems separated for two generations. Berlin had become an East German city overnight. After getting our personal bearings we turned back toward East Berlin and stepped back into the death strip on our way home. As we entered the forbidden zone an East German guard who blocked our way and demanded our passports approached us. When we produced our East German Diplomatic identity cards, he rejected them saying that the crossing was only for citizens of the German Democratic Republic. We argued that we, too, lived in East Germany despite the fact that it seemed incredible that any Westerner would voluntarily lived in that communist country. After some heated dialogue, we were allowed to pass. Stepping back into East Berlin was like wandering into the twilight zone, the country had disappeared, and a revolution swept away the Berlin Wall and would soon sweep away the very existence of East Germany itself. I knew East Germany’s days were limited. Only intervention by the Soviets could prolong its agony. President Gorbachev risked perestroika [restructuring] and glasnost [openness] in Russia if he chose to intervene militarily in the GDR; he would lose East Germany if he did not. We had no idea of the next steps or how the revolution would play out. 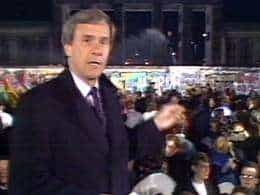 While the world was caught up in the euphoria of the pictures at the Brandenburg Gate, President Bush instructed us that there would be no dancing on the Wall. The East Germans had won some freedom, but the revolution had unleashed the forces of history contained by the cold war. Meeting with Gorbachev six months later, Gorbachev told President Bush that Germany could decide whether or not to join NATO. In the intervening months the greatest diplomatic venture since World War II was undertaken with the greatest skill. Germany, with the vision and skillful leadership of the American President and Chancellor Kohl, was unified and this millennium may end in peace with Europe whole and free. There was a time when the West stood for freedom. The wall came down cuz of russian inactivity, NOT because of anything the west did about it. All the ‘west’ cares about is money. And we lost a lot of bizness when that wall came down. We had to come with a whole new enemy, and quick! Thankfully, that war has lasted to the present day and should go on for at least another 44 years.